What's on tap for this week in the world of Ubuntu? 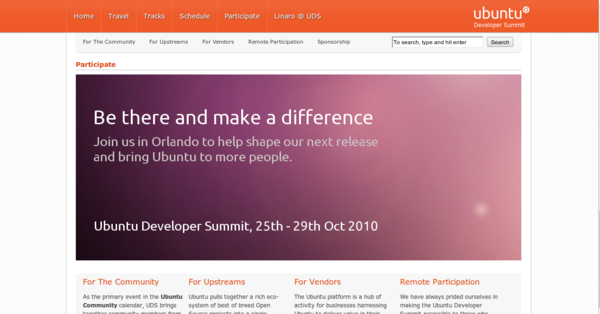 It's the Ubuntu Developer Summit for the Ubuntu 11.04, Natty Narwhal cycle, otherwise known as UDS-N.
Just as UDS website states, "Be there and make a difference", I'll be blogging, denting, tweeting, facebooking and more from the sessions this week. I am looking forward to seeing what we, as users of Ubuntu, can expect for our desktops, servers, ARM devices, and more from Ubuntu 11.04. There is also community sessions where I'll find out what projects are happening in and around the community where you can contribute and let you know about those as well. In just a few hours Mark Shuttlework, Founder of the Ubuntu Project, and Jono Bacon, Ubuntu Community Manager, will take to the "center stage". Bacon will be welcoming everyone and going over all the onsite general information and housekeeping expectations. Then it's on to the much awaited Shuttleworth Keynote where Shuttleworth is expected to share the future and bigger picture of Ubuntu, as well as some of the specific planning goals to be accomplished during UDS-N to shape those goals into the future of Ubuntu. If you haven't already take a look at the schedule, see what sessions you are interested in contributing too, and don't worry if you couldn't make it to UDS, there is always the remote participation option. Remote participation allows you to listen to the sessions and comment in the IRC channel for that session. You can find more information on remote participation on the UDS-N website. I am looking forward to letting you know all about UDS and more this week. Questions,Comments suggestions can be sent to Amber at: amber [AT] ubuntu-user.com.